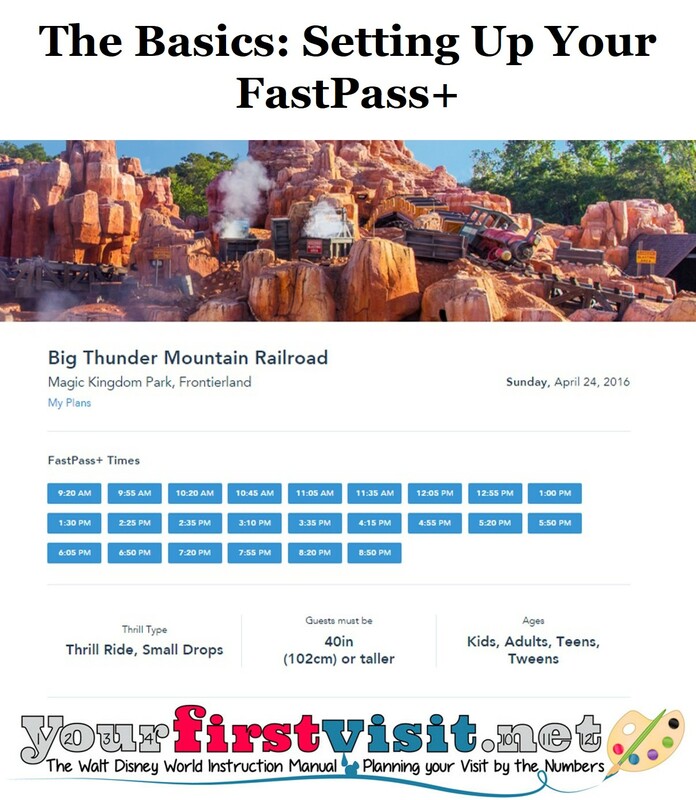 Disney World’s FastPass+ program is one of the most important ways to reduce waits on your Disney World visit. 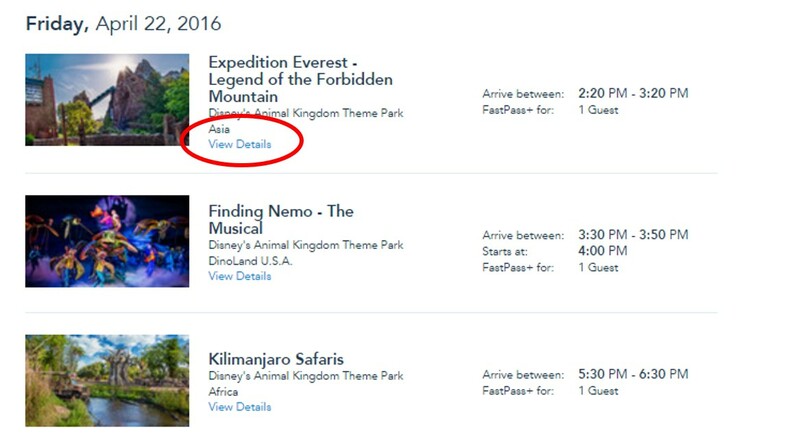 The overall program and recommended FastPass+ are covered here. 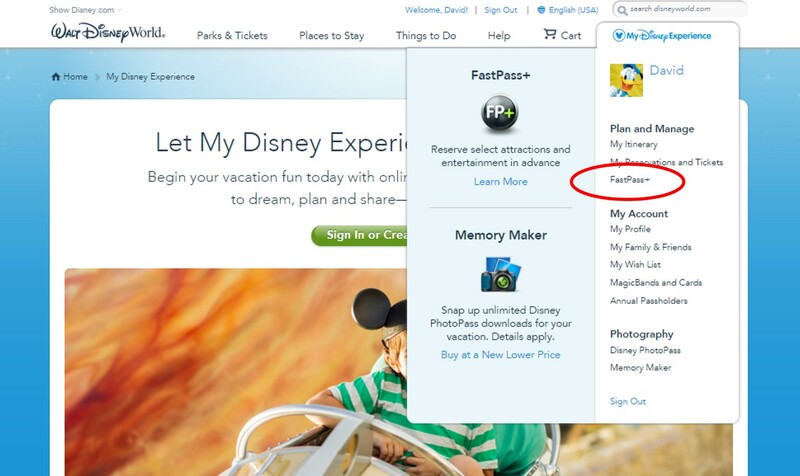 To book FastPass+, you need a My Disney Experience account with valid tickets linked within it for the folk for whom you plan to make FastPass+. 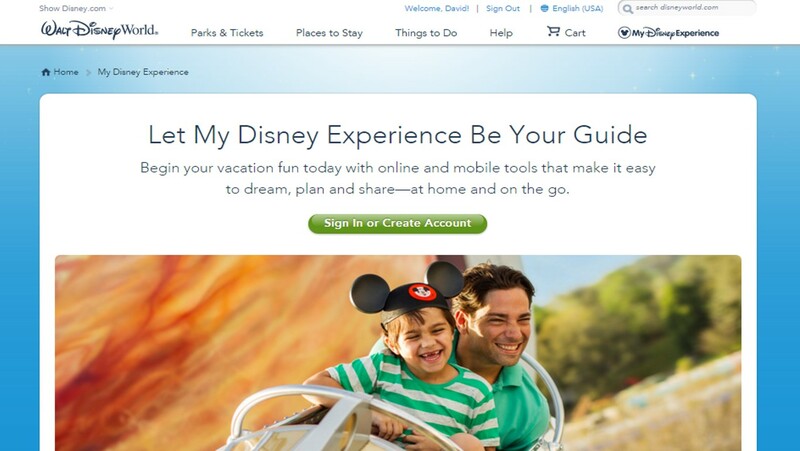 Log in, and at the top right hover over the words “My Disney Experience.” From the drop down that emerges, click FastPass+. Then you add, one at a time, FastPass+ up to a total of three per day. 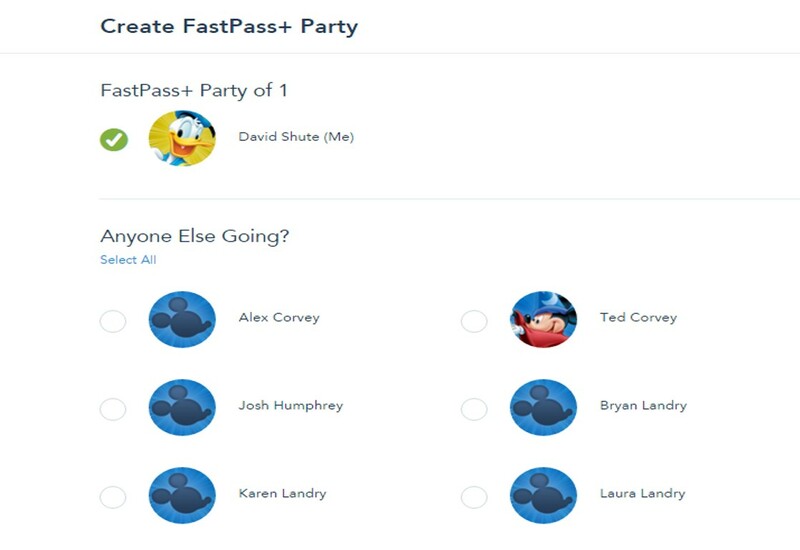 First you select the party for your FastPass+. …and then at the bottom of the calendar page the park. 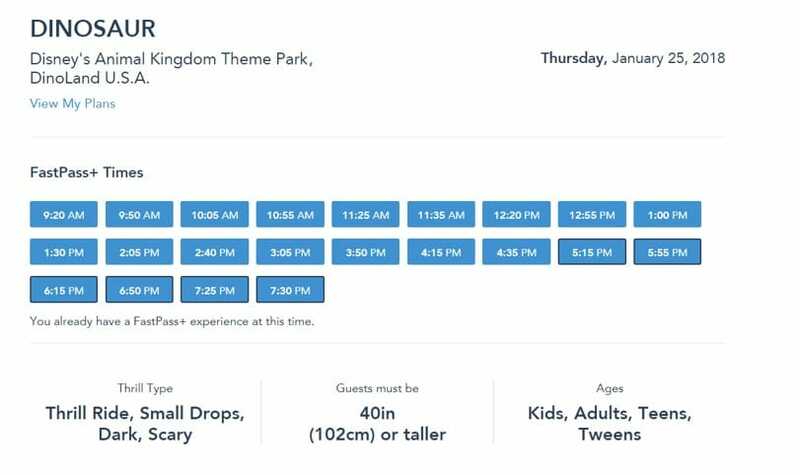 Rides and some possible times for your FastPass+ that day will then show on your screen. Note that there are tabs above where you can target morning, afternoon, and evening. 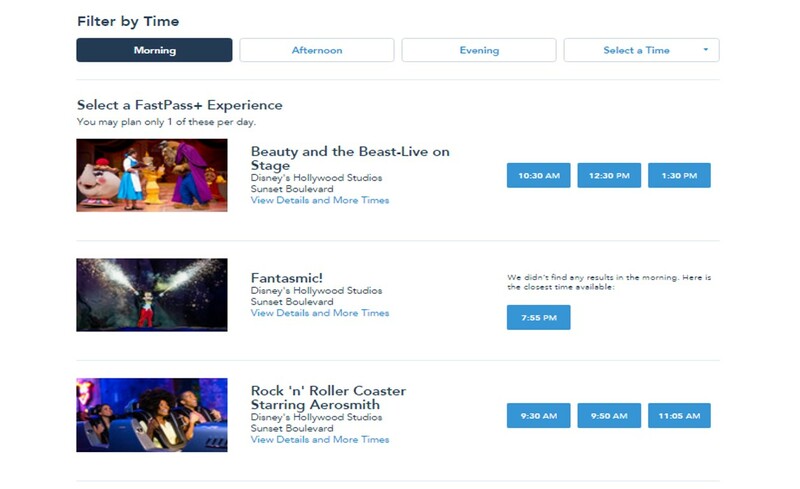 Attractions only available in the evening will still show, even if you picked morning, like Fantasmic in the image above. By clicking the rightmost tab, you can even target a specific time. 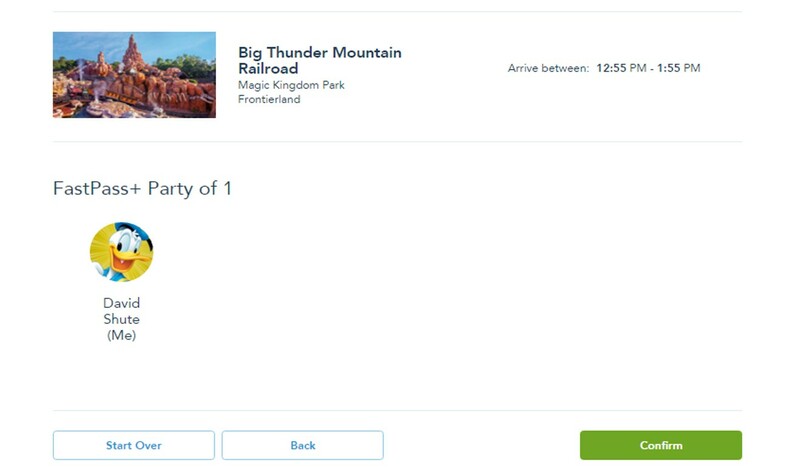 By default, the system will show only up to three time choices for each ride. Click it, and if available you’ll see a lot more times to pick from. It’s a little subtle, but times that conflict with your other FastPass+ have a black border around them. In the DINOSAUR example above, the black border begins at 5.15p. Tap the time you want, and hit the green “Confirm” button at the lower left of the next screen. 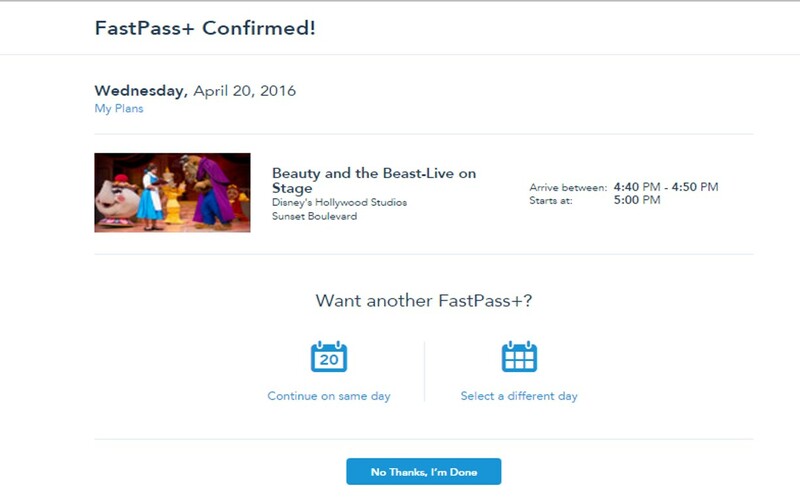 Your FastPass+ may conflict with another time you’ve picked, or even a set of FastPass+ at a different park. If so, you’ll get something like this error screen. 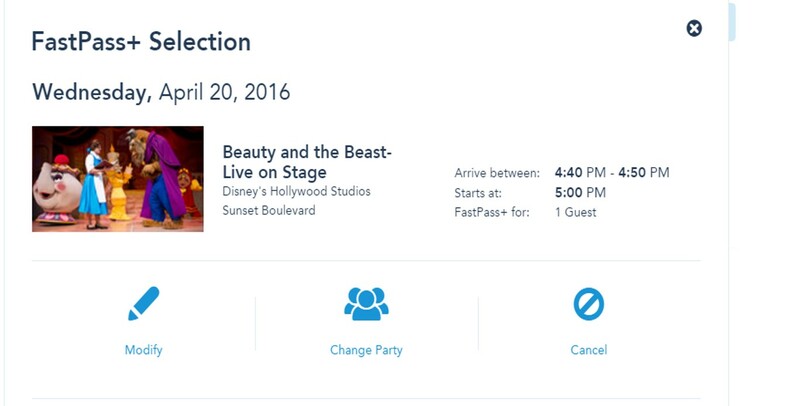 If you lose track of the FastPass+ you’ve already booked for that day, most pages have a link “My Plans” in the top left. Click that and a pop up of your plans will show up. Scroll down to the appropriate day to see what’s up, then X out the pop-up. Once you have a successful “confirm,” the screen above opens, giving you the choice of continuing that day or working another day. Either way, you will start back at the beginning, picking the people involved for whom you are scheduling a FastPass. 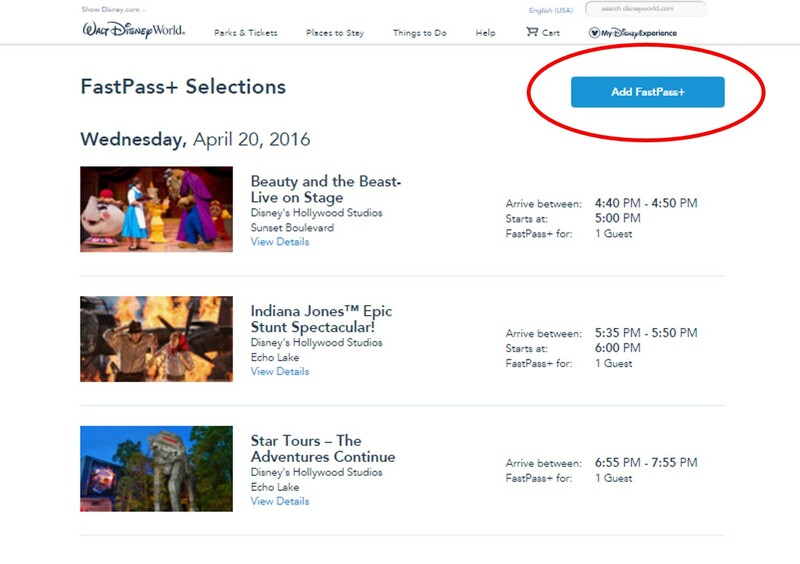 Click “View Details” and you’ll get a screen allowing you to modify the FastPass+–change its time, its folk, or cancel it altogether. As noted above, you can now make one, two or three in advance. In the old system, you had to book three. I’m helping my sister plan her Nov 16-20th trip. They’ll be in the parks Wed, Thurs, Fri, and Sunday. 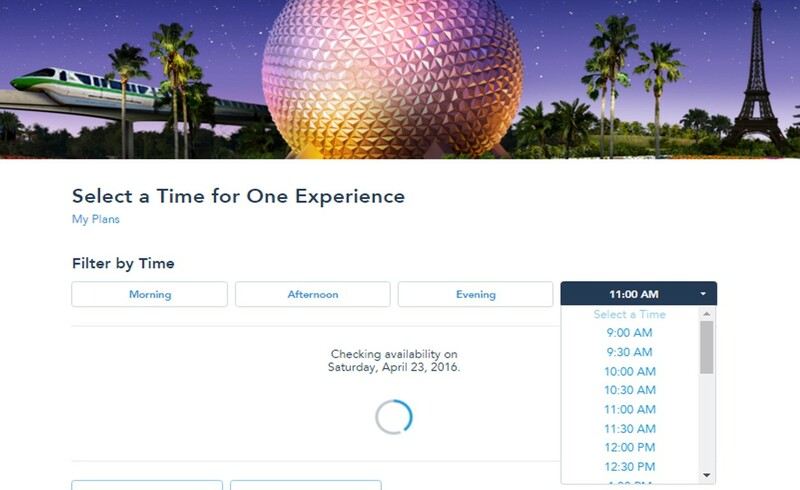 A friend is giving them their timeshare free of charge for the week, but they were thinking about booking one night at a Disney value resort just to get a couple of days worth of early reservations (60 days instead of 30) for their fastpass+. I’m waiting for the crowd calendars to be released for Nov., but I’m tentatively planning on Wed. MK, Thurs HS, Fri, MK, and Sun at AK. Which night would you recommend booking a Disney room? Andrea, I’ll be able to comment more specifically on November in a few days when the calendar is out, but the Thanksgiving crowds will begin the 19th, so the night of the 19th would be a good day to set as the value resort night. That makes sense. The only problem is they’re planning on taking Saturday as their rest day. 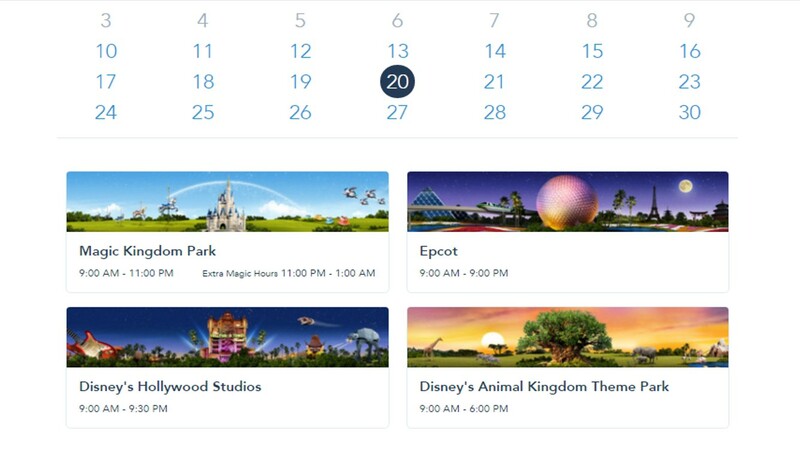 So, since they’re not going to be in a park that day they’d only get one day of early fastpasses, right? Or could book them for one of their earlier days in the park? Andrea you are right, but I’d wait a bit to confirm park days. Ok, I’ve looked at Josh’s recommended parks. Please let me know what you think about this tentative plan, and feel free to share if you have suggestions for my “??”s. I’m kind of waiting for nighttime schedules for the other parks to come out to determine where to hop on the MK early close nights. Also, would you recommend that they stay at a WDW resort the night of 11/16 or 11/17? Thanks! You’re awesome! 11/17 Rope drop MK, hop to ?? 11/18 Rope drop MK, hop to ?? Looks good Andrea. 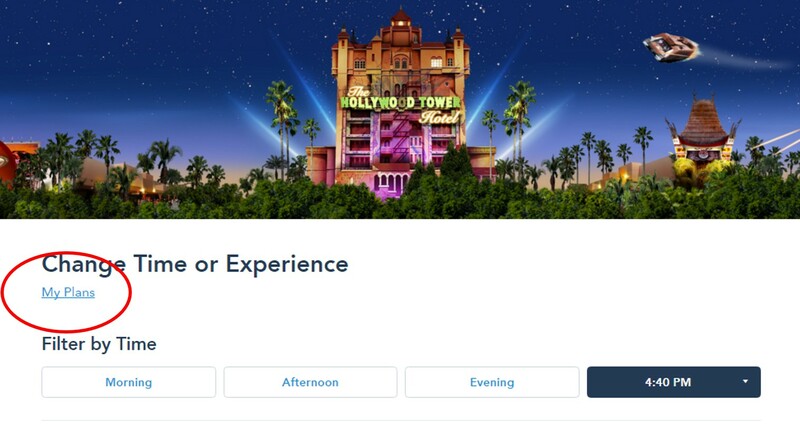 Either night could work fine for their WDW resort night. 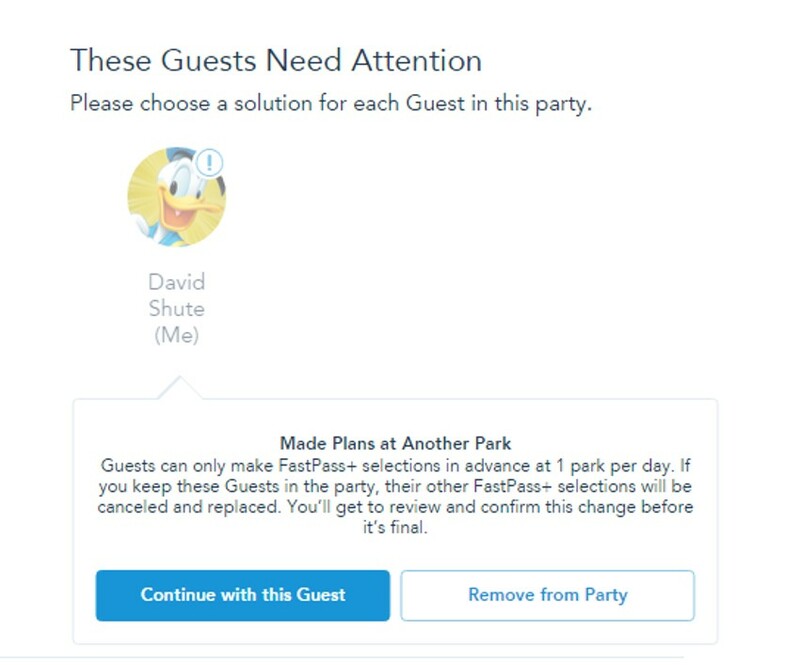 Dave, I’m confused, can you set up your fast pass+ in advance with your other normal selections, or can you only set up the + on the day of your park visits? Thanks for your help, I have bought your book and it is a great tool to have with you! 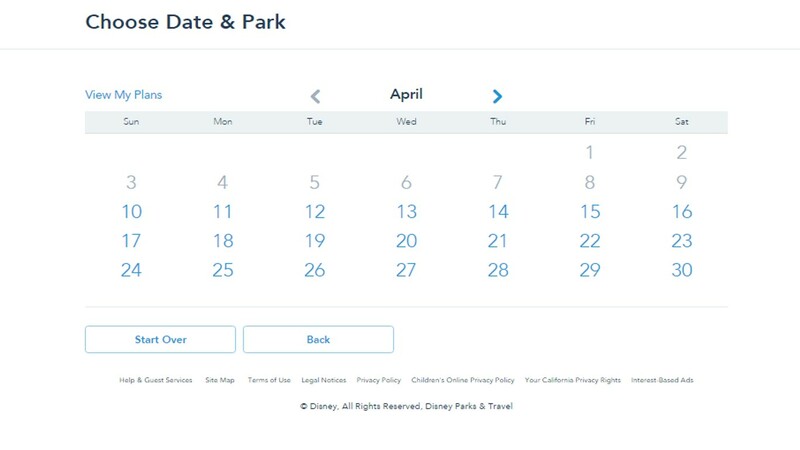 Mike, I don’t know what you mean by “other normal selections.” But you can–and kinda must–pick 3 FP+ a day 30 to 60 days ahead of your park day. Hi Dave, we took some of your advice and decided to do a split stay, starting with Pop and ending with YC. I recently just booked our ADR’s but came across an issue. 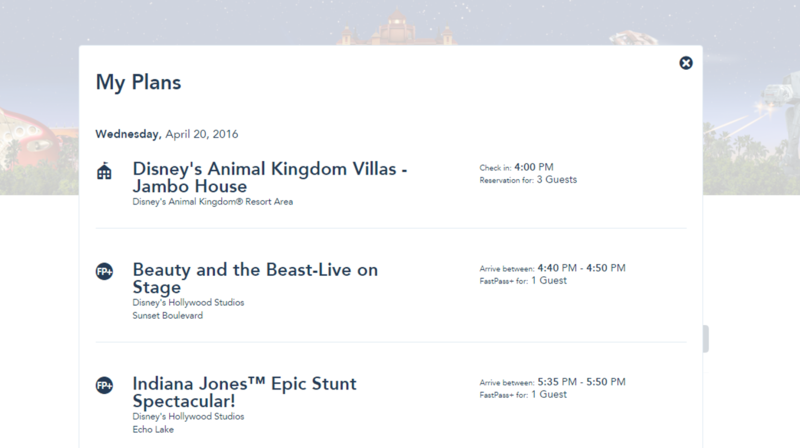 The split stay was booked with two different Res ID’s (per Disney). The trip is technically linked, but I could not book my ADR for the additional nights at YC. I had to wait three days for that check-in date. My Q: Will we encounter the same issue with FP+, and if so, is there a way around it? ie, could I change my Pop res to the entire length of the trip and then adjust it back 3 days later? Eric, that’s a great question. I’m finding conflicting answers (length of ticket vs length of stay). I think to be safe assume it is length of stay. The risk with changing your Pop ressie is that you may not be able to find availability to cut it back to your original shorter stay. The safest approach if you want to avoid the issue (which will likely be only relevant to FOP and 7DMT) is to add a third room only reservation covering all your dates and then to cancel it no later than a week before your arrival date. This will cost you, temporarily, the one night deposit. Thanks Dave! So if I understand correctly, I should make another ressie for the entire stay (at any hotel?) and then link that to my trip and I’ll have to leave a 1 night deposit (or $200 for the package deposit). Then at 60 days out I should be able to book FP+ for each day. Once FP+ is booked for all days, I can then cancel the 3rd ressie and at some point, I’ll get that money back. Is that right? Should the 3rd ressie be at the same hotel as #1 (Pop) for any logistical purposes? Eric, yup! It can be in any hotel, but the system may not let you double book one you’ve already booked, so avoid Pop. Don’t cancel the third hotel until a couple of weeks after your 60 day.